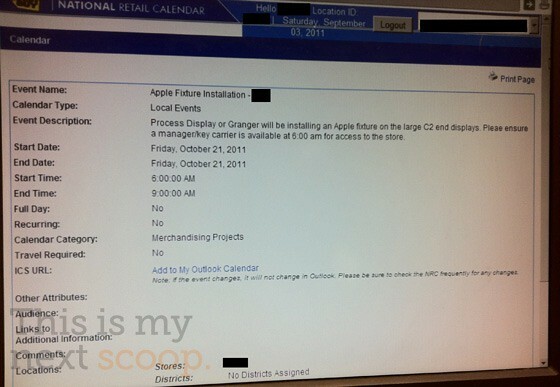 Discovered by This is my next, an internal BestBuy document points to an ‘Apple Fixture Installation’ Friday, October 21st. Interestingly, this date lines up with the mid-October range that’s being tossed around for the iPhone 5 release. This is my next’s source says that a manager being at the store at 6 A.M. to open the doors is out of the ordinary, seeing as they usually get there at 7 A.M. The source also said that this similar procedure happened with the iPhone 4 launch. BestBuy managers have a meeting scheduled on October 10th to talk “upcoming BIG release dates”. Sounds fishy, huh? If these reports and precedent are correct, we can expect the device to land early Friday morning. Apple is rumored to be hosting a press event at the end of September where they’ll announce the iPhone 5, and officially release iOS 5. You’ll remember our report that Apple will release the iPhone 5 October 7th, which is also a Friday. In terms of carriers, WSJ is reporting that Verizon, AT&T, and Sprint will be getting their hands on the device.